The industrial engineer helps decide how best to utilize an organization’s resources to achieve company goals and objectives. Introduction to Industrial Engineering, Second Edition offers an in-depth analysis of the industrial engineering profession. While also providing a historical perspective chronicling the development of the profession, this book describes the standard duties performed, the tools and terminologies used, and the required methods and processes needed to complete the tasks at hand. It also defines the industrial engineer’s main areas of operation, introduces the topic of information systems, and discusses their importance in the work of the industrial engineer. The authors explain the information system concept, and the need for integrated processes, supported by modern information systems. They also discuss classical organizational structures (functional organization, project organization, and matrix organization), along with the advantages and disadvantages of their use. The book includes the technological aspects (data collection technologies, databases, and decision-support areas of information systems), the logical aspects (forecasting models and their use), and aspects of principles taken from psychology, sociology, and ergonomics that are commonly used in the industry. 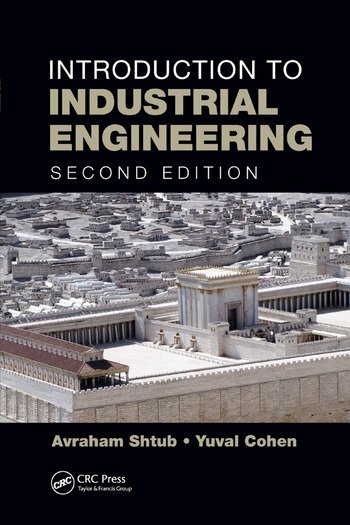 Introduction to Industrial Engineering, Second Edition establishes industrial engineering as the organization of people and resources, describes the development and nature of the profession, and is easily accessible to anyone needing to learn the basics of industrial engineering. The book is an indispensable resource for students and industry professionals. Professor Avraham Shtub holds the Stephen and Sharon Seiden chair in project management. He has a BSc in electrical engineering from the Technion—Israel Institute of Technology (1974), an MBA from Tel Aviv University (1978), and a PhD in management science and industrial engineering from the University of Washington (1982). Professor Shtub is a certified Project Management Professional (PMP) and a member of the Project Management Institute (PMI-USA). He has been a consultant to industry in the areas of project management, training by simulators, and the design of production–operation systems. Yuval Cohen is a senior faculty member at the Industrial Engineering Department of the Tel-Aviv Afeka College of Engineering. His areas of expertise are planning and operation of assembly lines, design and management of production and logistic systems, project management, supply chain management, and business decision making. Dr. Cohen served several years as a senior operations planner at FedEx Ground (USA) and received several awards for his contributions to the hub and terminal network planning. He received his PhD from the University of Pittsburgh (USA), his MSc from the Technion—Israel Institute of Technology, and BSc from Ben-Gurion University. "The authors have assembled a comprehensive introduction of industrial engineering with the inclusion of both traditional and emergent areas. Other books tend to give a shotgun view, this book provides a comprehensive overview of the field, and provides an excellent starting point for anyone new to the field." "… an excellent introduction to the history, profession, processes and practice of industrial engineering… The depth is relevant for a single introductory course in industrial engineering for engineers or as a supplement to a full industrial engineering curriculum…"